Probiotics are good microbes that live in the gut and aid in the digestion of food. There are billions of them living in the gastrointestinal system of every animal. The best dog probiotic supplements will aid your pet's body in making vitamins and nutrients, fighting off potential pathogens and boosting the dog's immune system among providing many other benefits. A recent study found that dog's microbiota is directly related to obesity in canines (i.e. an imbalance of bacteria in the gut leads to overweight dogs). * Click on the best dog probiotics for more information, prices and details. Scroll below to read reviews. While we still need a lot more scientific evidence to back up the use of probiotics for specific conditions in canines, a few studies have been done. One study showed how probiotics improve many GI related problems in dogs and cats; this study and this one observed how probiotics help dogs fight diarrhea and food related GI problems. Before adding any dog supplements to your pet's diet, be sure to consult your veterinarian or a trained canine nutritionist. A holistic veterinarian may be especially helpful when it comes to recommending the best dog probiotic supplements, but with more scientific evidence emerging, most vets are jumping to recommend them. What are the Best Dog Probiotics Supplements? Stress in dogs due to environmental changes, dietary indiscretion or drug therapy often results in an imbalance of the intestinal flora. This imbalance often manifests as diarrhea, bloating, gas issues and other gastrointestinal disturbance. A good balance between the good and bad microorganisms must be achieved to help maintain a healthy gut, efficient brain functions, and strong immune system. That's where this product from Purina comes in! 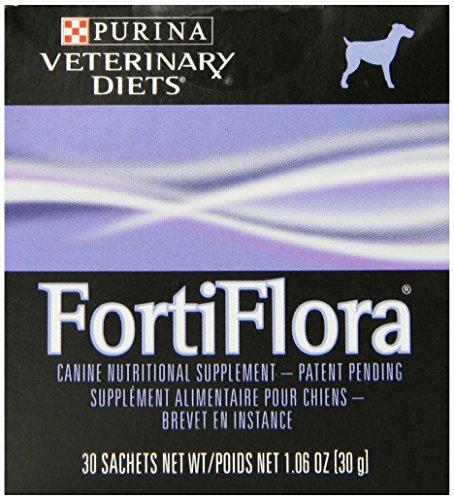 FortiFlora is a canine nutritional supplement that contains probiotics, antioxidants and vitamins to ensure that your dog’s tummy reverts to its normal condition in the shortest time possible. This bestseller is in powder form and is usually mixed or used as topping to dog food. Pet owners usually bought Purina FortiFlora Canine Nutritional Supplement to treat their dog’s diarrhea and excessive gas especially after observed coprophagia, or poop-eating. Huge quantities of the live beneficial bacteria in FortiFlora replace the bad bacteria, and the dog’s normal gut flora is restored. Some dog owners only give this when an intestinal infection occurs in their dogs, but many insist that making this a mainstay in their dog’s diet will keep the vet and drug medications away. Overall, dogs have become more energetic, less sensitive to allergens and had fewer bouts of gastric and other health issues. This supplement from PetVitalityPRO contains 4 billion CFUs of probiotics to maintain gut health in your dogs, plus prebiotics to ensure that the probiotics thrive. Aside from this highly-potent special blend, it’s also rich in natural digestive enzymes, antioxidants, vitamins, and minerals that boost the immune system and increase vitality. Available in jars of 60 and 150 duck-flavored soft chews, and it's made in the USA. This is one of the best dog probiotic supplements, as it is prescribed by vets for cases of diarrhea, constipation, bad breath, vomiting and other digestive tract issues. PetVitalityPRO Probiotic Premium Plus for Dogs is highly endorsed not only by vets, but also by pet owners who’ve seen firsthand how effective the supplement has been. Most pet owners learned of probiotics after other solutions have failed to stabilize their weak-bellied dog. To their surprise, the effect came in as short as a day or two. With this product, their dog’s poop became firmer, foul and excessive gas was reduced or eliminated, and breath became fresher. These probiotic chews have been a real life-saver for many dogs, especially the young, the weak and the aging ones. Dog owners say that their dogs are healthier inside, and that way, they don’t get surprise gastric episodes. 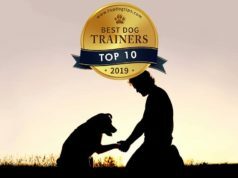 They also noticed that their dogs now very rarely get infections or allergies, have higher stamina and are more eager to engage in activities. Probably the only probiotic supplement that also supports healthy hip and joints, Amazing Nutritionals Probiotic is truly amazing. It comes in tablet form in bacon and beef liver flavor and is made in the USA. It’s best for canines in the puppy, adult and senior stages for giving their health a boost. It contains 7 billion CFU of probiotics to maintain a healthy digestive system, and glucosamine and chondroitin for strong hip and joints. It is recommended for dogs suffering from gut disorders, immobility issues, inflammation and arthritic pains. Giving the small tablets to dogs isn't an issue, and dogs even seem to think they are being given treats. Long-standing problems on gas, constipation, loose stools, stinky breath and irregular bowel movements went away after regular use of Amazing Nutritionals Probiotic Joint for Dogs. Acute diarrhea also improved after only a few tablets. This is surely a great two-in-one remedy for dogs suffering from problematic stomach and joint discomforts. Dogs with arthritis, hip dysplasia, and immobility due to age or injury were very much better off after a few weeks of this supplement. Not only were their pains lessened, their flexibility also improved. Owners observed other bonuses, too – their dog’s skin and hair now have a healthy glow, and aging dogs have become more agile and rejuvenated. Nusentia has created one of the best dog probiotic supplements that comes in powder form. The whole jar contains more than 360 billion CFUs of probiotic and prebiotic blend. Only a small amount is needed to address digestive issues in your dog, and dogs don’t usually notice it sprinkled on top of their food. This supplement is made in the USA, and a jar has about 360 scoops in it. It is recommended as a daily supplement for healthier gut and enhanced immune system. The dose, which is based on your dog’s weight, is usually doubled or tripled in times of stress. Pets given a regular dose of this probiotic were observed to have significantly improved. Their digestive system has become more stable, and constant bouts with diarrhea, loose stool, constipation, vomiting, flatulence and bloating have become a thing of the past. Buyers compare Nusentia Probiotic Miracle, Probiotics for Dogs to the other brands of the best dog probiotic supplements, yet think that it’s more reasonably priced. Pet owners whose dogs had been under prolonged steroid and antibiotic treatments, look at this supplement as nothing short of a miracle. Their dogs have suffered the side effects of drugs, but found no relief. After using this for a short time on their pets, the itching and yeast overgrowth cleared up. Their pets are healthier, have more energy, and are growing back hair. A 90-gram jar contains about 30 scoops of Dr. Mercola Complete Probiotics. Each scoop provides more than 58 billion beneficial bacteria that help create a balance of the good and bad bacteria in the digestive tract. A healthy dog has a healthy poop, meaning firm stool and regular bowel movements. Some pet owners say their pets became healthier inside and out after starting with this supplement when reading the reviews. It's one of the best dog probiotic supplements because it has 14 strains of beneficial bacteria that will boost your dog’s gut health, remove toxins and improve their immune system. This supplement has been a major life-changer in dogs suffering from irritated stomach, frequent vomiting, lack of appetite and loose stools. According to their owners, other brands of probiotic supplement hadn’t been much help, so they were really amazed at how quickly this low-dose probiotic supplement has solved their dog’s maladies. 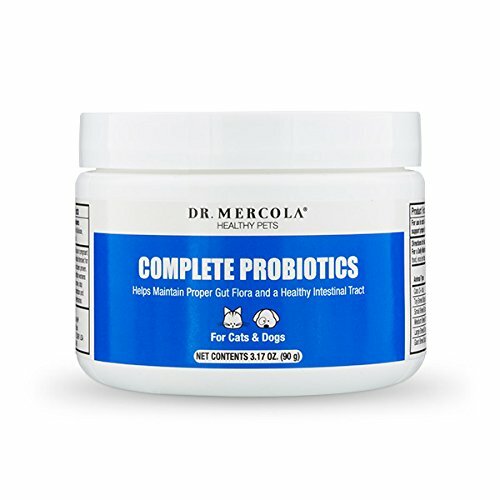 They find Dr. Mercola Complete Probiotics Dietary Supplement for Pets slightly costlier than some brands they’ve used in the past, but they’re sticking to this because of its efficacy. Dogs with sensitivities and skin allergies also responded well to this supplement. The owners have given their pets steroid pills and shots for their irritations but were not happy with the side effects, mainly the fact that their dog’s immune system is being compromised. They say this is one of the best dog probiotic supplements because the itching gradually disappeared and did so for good. Aging dogs similarly benefited from this supplement. TummyWorks Probiotic comes in powder form and is available in 104 g (80 scoops) and 208 g (160 scoops) containers. It contains 10 types of beneficial bacteria and a scoop provides about 2 billion CFUs of probiotics. Aside from its probiotic content, the supplement also has prebiotics that feed the probiotics, fish oil, and liquid glucosamine. Together, these components improve digestive health, help repair joints and cartilages, and build resistance to allergies and infections. This product is proudly made in the USA and is covered by a risk-free guarantee. One reviewer was so impressed with this product, stating that TummyWorks Probiotic for Dogs & Cats has remarkably improved the five different conditions of their five different dogs. Dogs don’t even notice a dose of this tasteless and odorless powder sprinkled on their food. It’s incredibly well-priced, too, and only a very little amount is needed every day to attain the required effect. It has helped restore to normal the bodily functions of dogs with irritable bowel syndrome (IBS), diarrhea, loose stool, constipation, poor appetite, vomiting and immobility. It has provided relief from itching, flatulence, bloating and joint pains. Marked improvement was also observed from dogs that previously suffered from bad breath, yeast infections, allergies, poor appetite, unexplained weight loss and lethargy. Dogs need dietary supplement of probiotics, since they don’t normally get them from regular dog food. The intestinal flora is often disrupted by stress, dietary indiscretion, antibiotics and other drugs. To replenish the good bacteria and regain balance in the intestinal flora, Advita Probiotic is often prescribed by vets. It was prepared from multi-strain probiotics and inulin prebiotic and is available in sachets of powder for mixing with dog food. Advita Probiotics Nutritional Supplement for Dogs helped to resolve issues of diarrhea in stressed pets. Pet owners preferred it over most of the best dog probiotic supplements that they knew because of the immediate effect they noticed in their pets. It was particularly helpful for anxious dogs that had to be boarded or brought to the vet or groomer. Cases of vomiting, gas, refusing food, gurgling belly, and other seemingly minor yet disturbing symptoms quickly go away after several meals mixed with this probiotic powder. A dog is only as healthy as its digestive system, so a supplement that ensures a balanced gut flora is a must in every dog’s food supply list. Next articleWhat Is Systemic Lupus Erythematous in Dogs?